Uber has inked a deal with Volvo that will see the automaker manufacture up to 24,000 XC90 sport utility vehicles (SUVs) that will be equipped with Uber's self-driving sensor and software package, Bloomberg reports. Uber will purchase the vehicles from Volvo, which will begin delivering them in 2019. The new agreement builds on the two companies' prior partnership, signed last year, to jointly invest $300 million in developing and testing self-driving cars. The vehicles from Volvo will form the start of Uber's driverless taxi fleet, and the purchase marks an important step in its self-driving ambitions. The ride-hailing company has invested heavily in developing its own self-driving technology — in contrast, Lyft has partnered with several other companies to develop self-driving cars. However, Uber's self-driving project has been plagued by the notorious lawsuit leveled against it by Waymo, which claims a former employee who joined Uber stole documents related to its self-driving technology. The purchase from Volvo demonstrates the company's intent to monetize its self-driving technology regardless of the lawsuit, which is set to go to court later this year. For context, Daimler also signed an agreement with Uber last year to eventually connect its self-driving cars to Uber's ride-hailing network, although it's not clear how many vehicles Daimler will provide or when. The deal also shows how Uber will scale its self-driving technology by purchasing vehicles and equipping them with it, representing a significant (though treacherous) opportunity for automakers. The move illustrates the major market that could develop for automakers to sell self-driving vehicles to ride-hailing companies. However, those sales likely won't make up for the massive drop in auto sales to consumers that many predict will follow the introduction of self-driving taxis. Strategy& forecasts that the total number of vehicles on the road in the US and EU will fall by more than 100 million by 2030, largely as a result of urban consumers abandoning their cars in favor of cheap autonomous mobility services. As a result, many legacy automakers are looking to launch their own autonomous ride-hailing services to compete with Uber and Lyft, and grab a piece of the new market. However, it's unclear how well they'll be able to compete with these players, which already have loyal and established user bases. 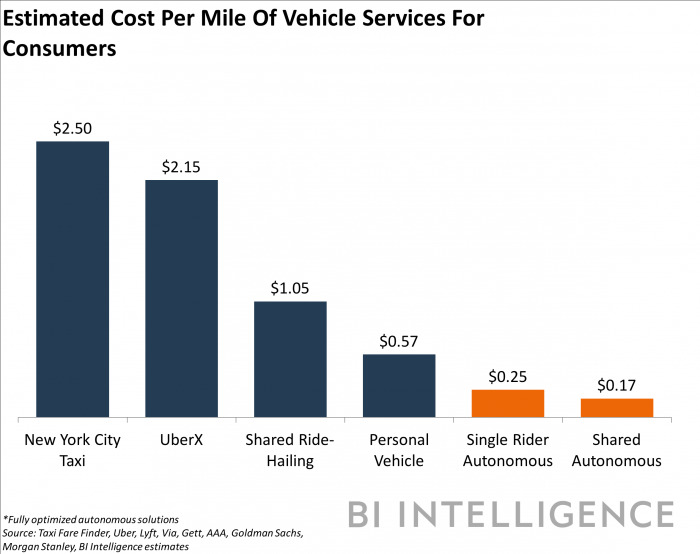 Meanwhile, automakers will be able to generate a great deal of revenue selling autonomous vehicles to ride-hailing companies as they scale their driverless taxi fleets. Uber's total purchase from Volvo could be worth more than $1 billion, Quartz reports. However, by doing so, automakers will also be empowering startups looking to disrupt their core consumer auto sales businesses.